The Navagraha are the nine planets of Vedic Astrology, also known as Jyotish. The Sanskrit word ‘nava‘ means nine and the word ‘graha‘ means ‘to seize’ or ‘to grasp.’ The planets are called grahas because they are the holders and dispensers of the karmic lessons of life and they are the evolutionary forces that teach us to grow and harmonize with the cosmic order. How do Grahas Affect Karma? In the same way that the daily weather can affect our feelings and especially our ability to get things done (karma), on a cosmic scale, the Navagrahas affect the “cosmic weather” from which our local planetary and regional weather is derived. If a planet brings rain, our crops grow. If a planet brings heat and drought, many perish. Each graha has a full compliment of energies, that match human characteristics. For example, Surya (the Sun) is considered a krūra graha, or harsh personality, because he is so hot and one can’t even look at him directly. At the same time, Soma (the Moon) is considered a saumya graha, or cooling personality, because the moon brings delight and coolness to the mind and the Earth. For more on the personalities of the Navagrahas, see the sidebar for Related Mantras. “Brahma, Vishnu and Siva always contemplate the Sun, Moon, Mars, Mercury, Jupiter, Venus, Saturn, the North Node and the South Node. May all the constellations remain in Peace.” – Cosmic Puja. The Navagrahas are powerful spiritual influences. The Hindu Panchanga is the spiritual calendar that reveals their times of influence through the yearly cycle of spiritual practice (sadhana). The Hindu Panchanga lists daily times for key festivals and prescribes suggested worship, or the avoidance of certain influences, in order to make our lives easier and help us to keep focused on the spiritual path. 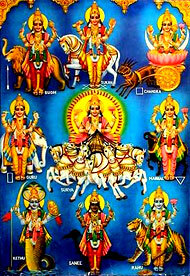 In addition to sadhana for various Navagrahas and their Ruling Deities, like Shiva, Durga, and other devas (listed in our Ways to Worship section), there are methods, or spiritual practices, called upāyas that may be prescribed by the Jyotishi (Vedic Astrologer) in order to promote greater peace for a specific individual according to their karma. Navagraha worship is regularly worshiped at the Devi Mandir. Every day, the Navagraha puja is performed as part of the Cosmic Puja. Hanuman Puja by Swami Satyananda Saraswati. This is also available as an iPad App. Cosmic Puja by Swami Satyananda Saraswati, includes Navagraha worship. This is also vailable as an iPad App. Please tune in to both the Audio and Video classes in other parts of this website which pronounce and explain every mantra of these texts, and also listen to the CD recordings of these recitations.